This paper deals with the storage ability of cathode ray tubes employing an alkali halide screen. This publication does not particularly refer to the Telefunken Blauschrift-Röhre type LB50 we, nevertheless, may assume that the CRT shown is equal to type LB 50. In Germany Dr. Violet of Telefunken was responsible for the design and application of Blauschrift-Röhren (= dark trace CRTs). In contrast to what is pointed out in this article is, that they did not use it for PPI purposes though, particularly for fast message storage as, for example, hand-written text or that like. 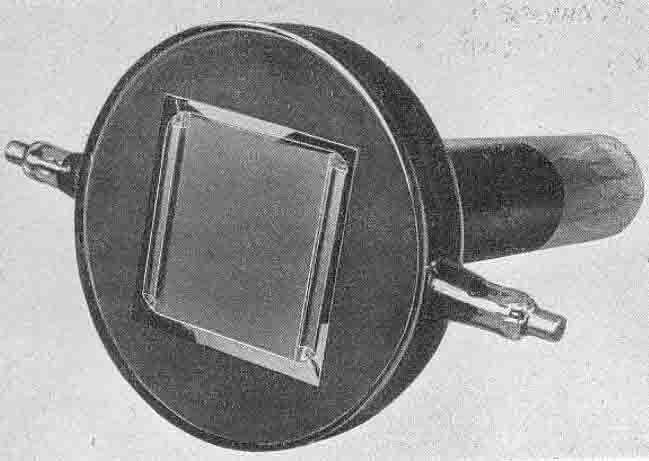 The tubes developed and made in Germany approached to a greater degree, the ideal shape of the time curve of the discoloration because heat was directly applied to the halide screen to cancel the trace. The method was as follows: On a thin sheet of mica a thin layer of tungsten film was deposited, thin enough to be transparent to visible light, but at the same time electrically conductive. The tube was not heated normally during the recording, but only when it was desired to cancel the trace was a current passed through the tungsten film which heated up quickly, thereby producing a temperature rise in the alkali halide. According specification it was possible to achieve erasure, even of a very dark trace, between 5 and 10 seconds. Fig. 5. shows a tube of this nature made in Germany by Telefunken. The metal caps on the sides of the tube provide connection to the tungsten film.